Its name origin is from Australia. The word Mookaite comes from the aborigine language that means "whitewater" as a reference to the place where it was found: Mooka Creek. The true name of this stone is Windalia radiolarite. You can also find it as Australian japser, mookite, mookalite, mookerite, moakite, moukalite and Moukaite. This stone is described as a silica porcelain that you can find in the Carnarvon Basin in Western Australia. You can also find opalite and chalcedony. It is a sedimentary fossilized rock located under the riverbed where silica mixed with white clay and petrified. You can find brown, yellow, red, and purple hues. The mookaite was a very valuable stone for the Australian aborigines who would think it had great healing powers. It has all the properties of jaspers plus particular ones. 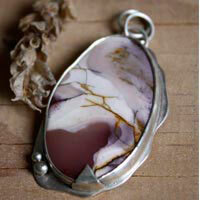 The mookaite jasper would help to lose weight and to feel good. The mookaite jasper would help fighting water retention and would relieve hernia problems. It is often used for stomach pains. It is often used for thyroid problems, cystitis, hyperglycemia, kidney troubles and bladder problems. The mookaite jasper would be meant to protect the fetus during pregnancy. It also has the same general properties than the ones of the jasper.